You’ll be keen on our Quinoa Scrub! Quinoa (pronounced keen-wah) is a wonder food that looks like a grain, but is actually a tiny seed that hails from the Chenopodium Quinoa. The ancient Inca’s dubbed this nutritious seed the “mother grain” owing to its high nutritional benefits. In terms of skin health, it is replete with calcium, phosphorus, folate, protein and lots B vitamins. 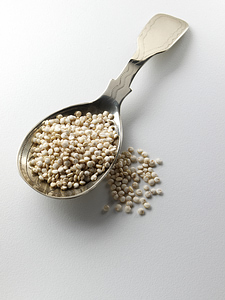 Apropos sustainable beauty, the Quinoa seed has exceptional exfoliating properties that scale away decaying skin and helps to maintain a healthy lipid balance that generates new cell growth. Here, we have gathered our earth-loving Quinoa and judiciously tossed it with an unbeatable combination of raw Shea Butter, organic essential oils, Hempseed Oil and vitamins. Plus, the natural scent of the essential oils makes our Quinoa Body Scrub all the more striking. Thus said, it simply needs for nothing – with the exception of being privileged enough to pamper your skin! This is our bare Quinoa Scrub that is ideal for purist’s who prefer their body scrubs unadorned and/or unscented as it were. This earthy scrub is served in a recyclable 16 oz. jar. A gratis 8 oz. 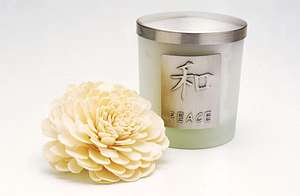 jar of our Calendula Spa Butter is included. Here, our Quinoa Scrub is twice-blessed with organic Ginger and Lemongrass Essential Oil. The addition of Lemongrass and Ginger is a striking pair that gives birth to a decadent, yet soothing body treatment that balances the mind, body and spirit whilst awakening the senses. This eco-chic scrub is served in a recyclable 16 oz. jar. A gratis 8 oz. jar of Ginger Lemongrass Spa Butter is included.